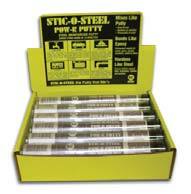 STIC-O-STEEL is a hand knead-able putty which starts to harden within minutes of mixing. STIC-O-STEEL is extremely tough and durable with exceptional adhesion to a wide range of metals. After one hour, it can be drilled, tapped, filed, machined, etc. Will not rust or oxidate, impervious to chemicals and corrosion. Will adhere to wet surfaces, underwater, and within chemicals. 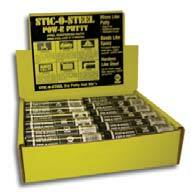 STIC-O-STEEL Is Fast With a setup time of 4-5 minutes, it becomes STEEL hard in 15 minutes, and is completely cured within One hour. Ready to be drilled, sanded, tapped, primed and painted in any home, office, shop or marine environment. STIC-O-STEEL As a result of a proprietary blend of materials which includes steel reinforcement as well as the highest grades of epoxy, it has a technical hardness rating of D-87 when cured. (In the Shore measurement system ‘D’ is the highest possible rating.) 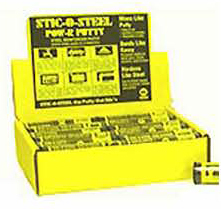 STIC-O-STEEL is impenetrable and impervious to chemicals such as shop fluids, gasoline, diesel fuel, antifreeze, solvents, oils, and caustic fluids such as battery acid. It can withstand temperatures as high as 550°F (288°C) and as low as -91°F (-68°C). Shelf life is a minimum of 3 years and is certified by NSF for repairs on all drinking water pipes, tanks, and systems. STIC-O-STEEL works underwater or in fluids and in all atmospheric conditions. Repairs can be made inside a container, tank, etc. with liquids still present- no need to empty first!.